The Avalon String Quartet, ensemble in residence at Northern Illinois University in DeKalb since 2007, is a truly international group. First violinist Blaise Magniere was born in France, violinist Marie Wang is Chinese-Canadian, violist Anthony Devroye was born in Belgium and raised in the U.S., and cellist Cheng-Hou Lee moved to the U.S. from his native Taiwan while in high school. 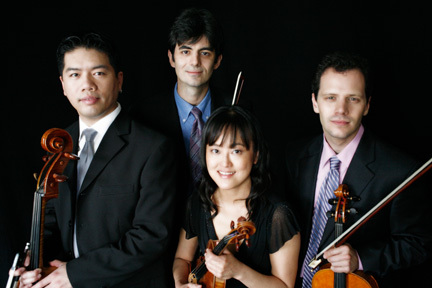 This season marks the fifteenth anniversary of the Avalon Quartet’s founding, and while Magniere and Wang are the only remaining original members, the Avalon Quartet still offers attentive musical teamwork and scrupulously blended ensemble. Magniere’s Gallic background is manifest in the clarity, elegance and technical sheen of his violin playing, yet the stateside graduate training of all is reflected in the group’s bold and forthright style, heard Friday night at Gottlieb Hall. Beethoven’s Quartet in B flat, no. 6 of his first Op. 18 set, is an early work but we can hear the young firebrand rudely pushing Rococo boundaries, particularly in the schizoid contrasts of the concluding movement, subtitled La Malinconia. The Avalon Quartet clearly positions this transitional work from the world it is coming from rather than the one it is ushering in. It’s a valid approach and the musicians presented a worthy performance at its best in the Adagio, led by Magniere’s poised expression. Still the performance had a bit too much Classical restraint even for early Beethoven, with rather straight-faced playing that could have smiled more. More crucially the conclusion was sensitively played but seemed too inhibited, with the dark abyss unplumbed and the hectic joi de-vivre insufficiently contrasted. Conversely in Debussy’s Quartet, the group initially seemed to take too vigorous an approach, but soon served up a performance that ideally captured the bracing edge and spare, fin-de-siecle lyricism. The second movement deftly conveyed the music’s strange mercurial quality, but the Avalon’s finest playing of the evening came with the Andantino, given intensely focused expression by all with especially luminous solo work by Magniere and Devroye. The program concluded with a ripe dollop of Late French Romanticism with Rachel Barton Pine and Matthew Hagle joining the Avalon members for Chausson’s Concert for Piano, Violin, and String Quartet. This sprawling four-movement work is, in essence, a double concerto for violin and piano with the quartet taking the place of the orchestra. Cast in Chausson’s most richly melodic vein, this is music that fits Barton Pine’s Romantic sensibility like a well-tailored glove. The violinist showed herself fully in synch with Chausson’s restless, rhapsodic style yet her playing was consistently elegant and in scale. She gracefully conveyed the esprit of the swaying Sicilienne, as well as the pensive introspection of the Grave movement, bringing impassioned fervor to the finale. Hagle took a more understated approach than was ideal at times for this duo-concertante work, but provided polished and alert keyboard work. Magniere and Wang switched places for the Chausson, and while coordination with the two soloists wasn’t completely airtight, the ensemble’s refined corporate tone suited the French music, with sonorous heft as required. The Avalon String Quartet will be joined by cellist Yehuda Hanani 7:30 p.m. Feb 10 at Gottlieb Hall in Arensky’s String Quartet No. 2, Beethoven’s Rasumovsky Quartet, Op. 59, no. 2, and Prokofiev’s String Quartet No. 2. www.brownpapertickets.com; 800-838-3006.